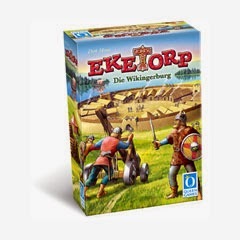 Eketorp is a modern designer board game published by Queen Games. 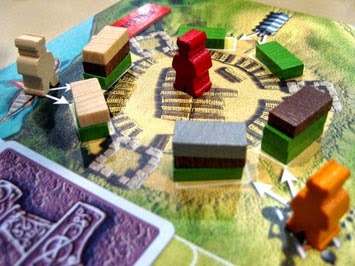 The game is themed around viking strongholds with players trying to gather resources and build up their stronghold while defending attacks and attacking other players. Each turn players simultaneously make a choice about how to allocate their vikings by selecting various actions on an individual player panel hidden from others behind a screen. Actions are then played out with resources won, strongholds attacked and defended through to resolution. The game is reasonably straightforward and incorporates a nice amount of variety through card play and hidden simultaneous selection. There is just one problem. The english manual is horrible and includes a very disruptive error that totally confuses the rules and changes the nature of the game if played as written. Board game hobbyists will probably suspect something is wrong and seek out clarification from boardgamegeek where the error is discussed and a correction is provided by players. However the publisher Queen Games has never corrected this error in the english language manual and it remains in error even in electronic form on their website. This is very poor from Queen Games. They did not sufficiently proof the english translation of the manual, failed to notice the mistake after going to press and include a separate correction, and still fail to recognise the error on their website. Did the game sell so poorly that the work required to recognise this and alert players (say 10 minutes) is too great? Queen Games have. Needing to clarify rules through a third party enthusiast website rather than directly with Queen indicates that they have failed their customers in the case. Errors in videogames are easily fixed with online connectivity and would be patched automatically before players start a game. This means that the system driven rules enforcement of a game can be altered even after manufacturing. Boardgames are entirely player driven and so all rules enforcement is done manually based on the supplied printed materials. Surely this means that publishers have an obligation to communicate necessary updates and fixes through an easy to find mechanism - such as the product page or support section of their website. Eketorp is fun when played with the correct rules and I would recommended it to others. I suspect supporting 6 languages in a single package is asking for trouble Queen - get your act together.